A Gartner Magic Quadrant Report? 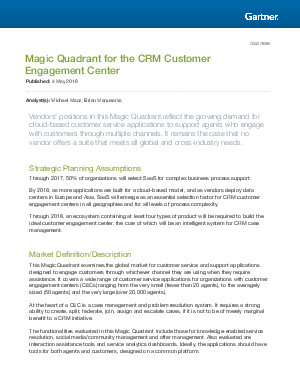 This Magic Quadrant examines the global market for customer service and support applications designed to engage customers through whichever channel they are using when they require assistance. It covers a wide range of customer service applications for organizations with customer engagement centers (CECs) ranging from the very small (fewer than 20 agents), to the averagely sized (50 agents) and the very large (over 20,000 agents).